We are delighted to announce that the MongoDB Connector for Apache Spark is officially certified by Cloudera. MongoDB users may already integrate Spark and MongoDB using the MongoDB Connector for Apache Spark, a fully supported package maintained by MongoDB. This connector allows you to perform advanced analytics and machine learning against the data sets that reside in MongoDB. Users of Cloudera may use this same connector to run Spark jobs from their managed clusters against both MongoDB Atlas and self-managed MongoDB instances. Apache Spark and MongoDB are a potent analytics combination. MongoDB’s flexible schema, secondary indexing, aggregation pipelines, and workload isolation make it easy for users to efficiently process data drawn from multiple sources into a single database with zero impact to other business-critical database operations. Running Spark on MongoDB reduces operational overhead as well. Running Spark jobs on MongoDB eliminates the need to ETL duplicate data to a separate cluster of HDFS servers, greatly simplifying your architecture and increasing the speed at which analytics can be executed. MongoDB Atlas, our on-demand, fully-managed cloud database service for MongoDB, makes it even easier to run sophisticated analytics processing by eliminating the operational overhead of managing database clusters directly. By combining Cloudera and MongoDB, Atlas users can make benefit of a fully managed analytics platform, freeing engineering resources to focus on their core business domain and deliver actionable insights quickly. 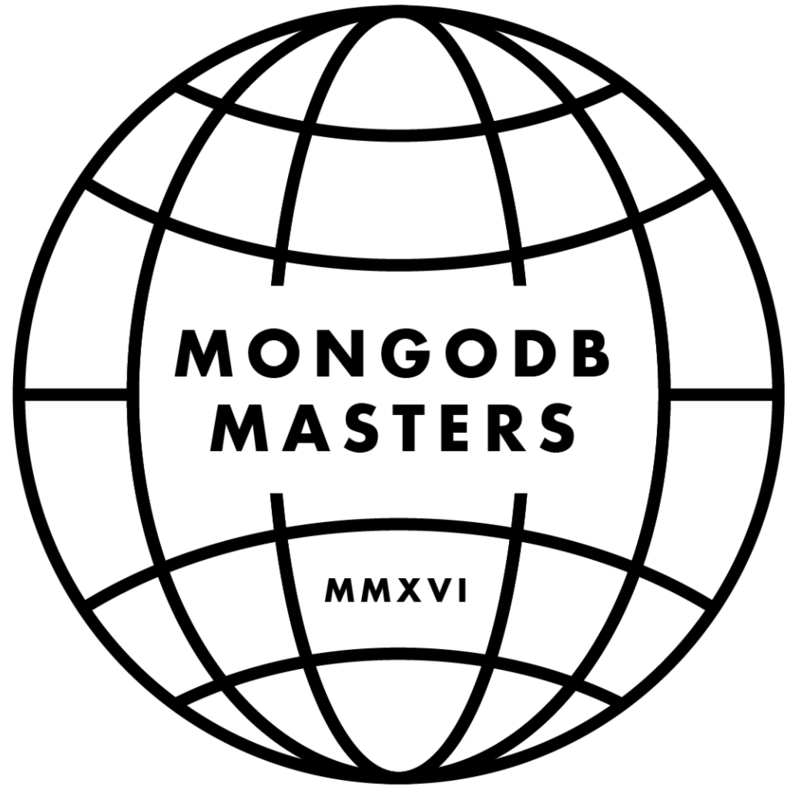 We are extremely excited to announce the 2016 MongoDB Masters Class. The MongoDB Masters are leaders within their community, experts in MongoDB, and love to share their knowledge with others. This year’s class includes returning Masters, as well as new members who have distinguished themselves in the past year. The MongoDB Masters Program began in 2011 and became one of the most important parts of our community. These Masters are some of the first users of MongoDB and they have done it all – from maintaining their own open source MongoDB projects, to organizing MongoDB User Groups, to writing books about databases. Masters have provided valuable product feedback and driven thought leadership in our field. We look forward to deepening this relationship over the coming year. This year’s class of Masters will be encouraged to participate in beta testing programs, share their experiences with MongoDB, and establish their own voice as leaders in the database community. Growing the Masters is a priority for the MongoDB Team. In addition to having our existing Masters recommend peers as new master candidates, we’re also finding and mentoring Masters via the MongoDB Advocacy Hub, an online platform designed to further involve the community engagement. Advocates who display a high level of leadership and experience within the Advocacy hub can then be invited to join the Masters program. We are extremely proud of the MongoDB Masters Program and look forward to working with the 2016 class with verve. Preparations are underway for MongoDB Masters Summit, which will be held on June 27th as part of MongoDB World 2016, where Dr. Eric Brewer, Dr. Hannah Fry, and Mythbuster Adam Savage will be keynoting. We encourage all members of our community to register for MongoDB World 2016, meet the Masters in person, and join our Advocacy Hub to start their own path to becoming a MongoDB Master. Read more about the 2016 Masters and their bios. We’re excited to announce that nominations for membership in next year's MongoDB Masters program are now open. New members will be announced in June and will be invited to participate in the MongoDB Masters Summit held before MongoDB World. What is the MongoDB Masters program? The Masters program is a special effort to gather a group of experts outside of MongoDB for the sake of sharing knowledge, educating other users, and serving as leaders in our community. The folks we're looking to attract have both real world experience with MongoDB and exceptional expertise within their domain. How will Masters be chosen? MongoDB Masters are our best community advocates and MongoDB experts. This year we will be choosing MongoDB Masters based on their work in the Advocacy Hub. What is the MongoDB Advocacy Hub? Advocacy Hub is a portal designed to engage our most enthusiastic users in a personal fashion. The Hub is a place where they can learn more about MongoDB but also increase technical skills and understanding. Members of the Hub, who we call Giants, complete challenges and earn points for participating in the community. We’ve already seen a great amount of interest in the short time since its launch. This year, we are using the hub to identify and reward our best advocates, and put new candidates on the path towards becoming a Master. Anyone in the MongoDB Community can join the Advocacy Hub through our open sign up. Those who excel on the Hub will become contenders for the MongoDB Masters Program. You can nominate a MongoDB Master by joining the Advocacy Hub and completing the “Nominate a Master” challenge. You can nominate yourself if you’d like to be a Master. It will only take you 3 minutes. Once you’re done, have a peek around and see the other technical challenges that you can complete to learn more about MongoDB. We look forward to seeing your nominations! Community participation provides us with the feedback required to make our product better, for users to share experiences, and for the expansion of knowledge and expertise around MongoDB. We’re looking forward to seeing your nominations and announcing the next Masters! It’s the holiday season and at MongoDB, we got to thinking about how efficiently Santa could deliver presents around the world. Visiting every Christmas-celebrating house in one night seems like a challenge, but none too big for an engineer. Congratulations to Dror Asaf for solving the traveling Santa challenge. Dror determined the correct path for Santa to take to reach the 10 most populous cities in the least distance required. Dror’s methodology was pretty straightforward. Starting at the North Pole, Dror used MongoDB’s geospatial indexing and queries to select the next city to visit at each stage of the journey. Dror’s strategy finds the closest city to Santa’s current position and sets that city to visit next in Santa’s world tour. You may notice that while this works for the set of cities in the challenge, a next-nearest-destination isn’t a general solution to the traveling Santa problem. I’ve described a general solution below. But before we get there I need to admit a mistake. Which would put Osaka at a location adjacent to Port Lincoln, Australia. Last time I checked, Osaka doesn’t go there. The correct latitude is 34.693889. Now, let’s take a closer look at the Traveling Santa problem to find a general solution. The starting dataset I provided only included the the geo-coordinates of the cities. You, the participant, need to calculate the distances between the cities before you can actually solve the problem at hand. I included this additional twist in the problem to focus attention on a common snag when calculating distance between two points on a globe. For example, let’s say I wish to fly from Honolulu to Tokyo. 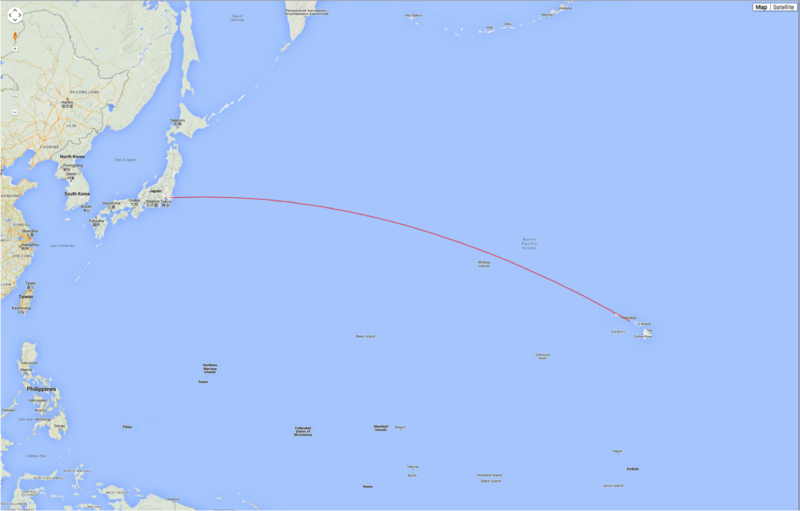 Tokyo is west of Honolulu, so it would make sense to fly west to reach it. However, not all maps get this right. 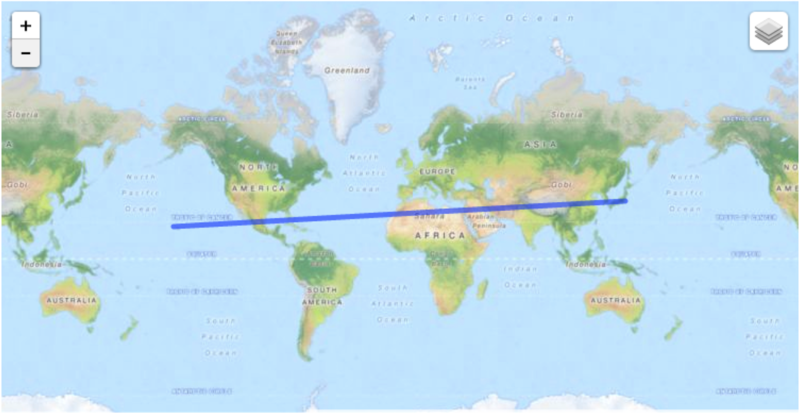 Check out what happens when I ask this web-based mapping service for a path from Honolulu to Tokyo. 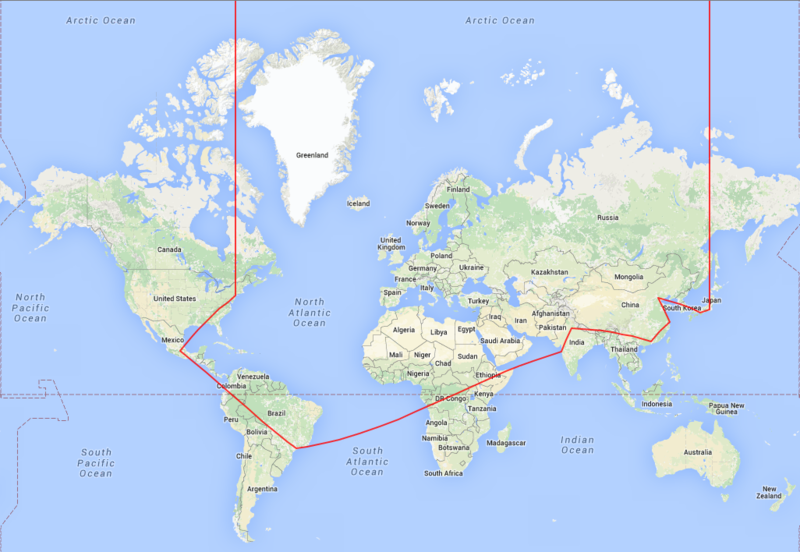 This mapping service pointed me in the wrong direction, going the long way around the planet. It did this because it models the Earth as a 2 dimensional surface with edges, just like a flat piece of paper. Its surprisingly common for databases that claim to support geospatial indexes to only expose 2D planes. In this model, the Earth is simply a flat plain over which we’ve imposed a coordinate system centered at latitude 0, longitude 0. 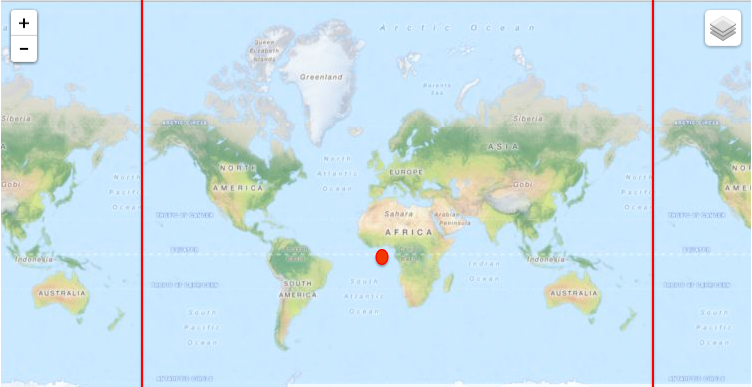 Here’s a visualization of this 2D way of thinking, where the origin of the coordinate system is marked with the red dot and the edges of the Earth are marked with red lines. The edges of this model is the anti-meridian. The Earth is of course not a flat plane but a 3 dimensional surface. So, we’ll need a way to calculate the distance between two points on a globe. This is called a haversine formula, and with this function we can derive the shortest distance between Honolulu and Tokyo. To find the shortest path, starting at the North Pole, I initialize the Path object by plugging in the North Pole as the first city I have visited and then pass this initialized object to the recursive function ‘visit’. The complete code solution is available here, and once complete I can assert that Santa’s best route to reach all 10 cities in the shortest time. Very astute readers will see that that this is the same path as Dror’s solution, just traversed in reverse order. The “route” field in the document is a geojson formatted LineString I’ve added to the result document which was used to render the paths you see in the maps above. Now, you may notice this is an exhaustive and brute force approach to solving a problem which is known to be more difficult to solve the more points you need to visit. This is why I limited the number of cities Santa would be visiting to 10. However, I can certainly think or a couple of optimizations which could be added to make my code even faster. I’d encourage you to take a look at the solution and make some suggestions in the comments below. Better yet, register in our Advocacy Hub, take part in the challenge with a gist of your own solution! Want to learn more about geospatial capabilities in MongoDB? Check out my presentation on geo-spatial queries or read our recent blog post on the geospatial performance improvements now live in MongoDB 3.2. No matter what database you use, there’s a variety of maintenance tasks that are periodically performed to keep your system healthy. And no matter what database you use, maintenance work on a production system can be risky. For this reason maintenance work is typically performed during periods of scheduled downtime – the database is taken offline, and normal business operations are suspended. Usually these hours are more convenient for users, but less so for the operations teams (e.g., early morning hours on the weekend).